Taco Bell's new Naked Chicken Chalupa, which is essentially a taco with a shell made of fried chicken is set to launch sometime next year (although I got to try it a little early). 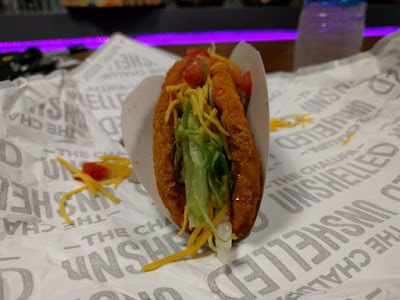 The new menu item was tested both as the Naked Crispy Chicken Taco as well as the Naked Crispy Chicken Chalupa last year. It's main feature is a flatten round piece of chicken that is battered and folded into a taco shape before frying. With chicken as the shell, you won't find any meat filling. Instead, it's filled with lettuce, cheese, tomato, and avocado ranch sauce. As I mentioned, I got an early test of it and thought it was really good. It was a little salty initially since you bite into the fried chicken first but balances out once you hit the filling. The chicken shell had a substantial crunch as well as a solid kick of spicy heat; much more so than any other current Taco Bell meat option. The chicken is a completely different recipe from their previous fried chicken option. The chain hasn't yet announced a specific month for the launch next year but you can expect the Naked Chicken Chalupa to be priced at $2.49 (varying with location) when it comes.